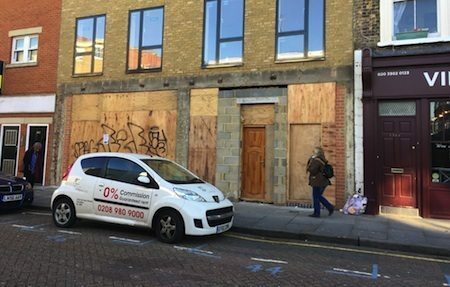 This shop – formerly Shoe World at 538-540 Roman Road – will now become half-a-shop if planning permission is given to convert the rear half into a 3-bed maisonette. Why not, you may say, there is a housing problem, people need somewhere to live. So what if a private developer wants to make a few bob, someone gets somewhere to live. But are we prepared to let developers dismantle the social infrastructure – our shops, our pubs – of our community. Do you want to see the Roman Road become a residential street with just a few shops. Is this scaremongering? Its just one shop after all! But its not the first one to go this way, more likely its the thin end of the wedge, because where unfettered profit is king it will carry all before it. As we have seen with our Where’s Our Boozer Gone? campaign, perfectly profitable pubs are being closed because residential property will yield even more profit. The Roman Road Trust are fighting to keep the Roman Road a vibrant and working commercial and social hub that combines the best of the traditional East End with best of the new, support them and your community by writing to the council to stop this development. One of Roman Road’s largest retail spaces is under threat and we need your support to help protect this important commercial unit from becoming yet another residential property on our high street. See the proposed plans and our letter of objection here and, if you agree, please send a copy of it to the Council”s Planning department via the email address provided. One of Roman Road’s largest retail spaces is under threat and we need your support to help protect this large commercial unit from becoming yet another residential property on our high street. The owners of 538-540 are proposing to reduce the area of the retail space by nearly half in order to build a three bedroom residential maisonette, right in the heart of the Roman Road Market where vital footfall is at its greatest. The ground floor will be reduced from 125 sqm to 55 sqm, and the basement floor will be reduced from 175 sqm to 103 sqm, The proposed plan (PA/16/03072) means most of the retail space will be located in the basement with poor access and visibility from the high street. We feel this is unacceptable in such a central high street location. Additionally the proposed plan excludes essential facilities for toilets and/or kitchen. Roman Road is dominated by small retail units and lacks the larger commercial units vital for a well balanced retail offering. Roman Road Trust has been approached by several businesses seeking a large enough space for a creche, a boxing club, a yoga centre, a cycle repair shop, a deli/health food shop, a large restaurant/bar and a performance space. This unit is one of the few premises that would be able to accommodate one of these vibrant high street services that Roman Road currently lacks. Help us object to ensure that Roman Road retains its few larger commericial units that are essential for a healthy, diverse high street offering. Please send the email below to dr.developmentcontrol@towerhamlets.gov.uk remembering to cc. hello@romanroadtrust.co.uk. Please act fast – there isn’t much time left until the end of the consultation period. I would strongly encourage every one who loves the Roman Rd. Market to oppose this application. Developers are ruining all our Heritage Ray Gipson.